AV block. Including complete AV block and Wenkebach. 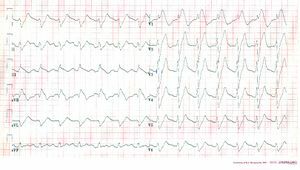 Intoxication can lead to an SA-block or AV-block, sometimes in combination with tachycardia. NB these effects are increased by hypokalemia. In extreme high concentrations rhythm disturbances (ventricular tachycardia, ventricular fibrillation, atrial fibrillation) may develop. Additionally, several arrhthytmias can be seen. An example of severe nortriptyline intoxication. The inhibitory effect on the sodium channel manifests as a broadened QRS complex and a prolonged QT interval. Another example of severe nortriptyline intoxication. An example of a severe amitriptyline intoxication. The inhibitory effect on the sodium channel manifests as a broadened QRS complex. 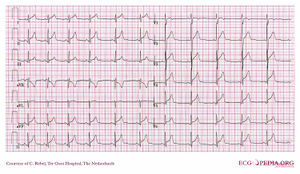 An ECG of the same patient before the intoxication. Myocarditis is an inflammation of the myocardium and the interstitium. The symptoms are faint chest pain, abnormal heart rate and progressive heart failure. It can be caused by several factors: viruses, bacteria, fungi, parasites, spirochetes, auto-immune reactions, borreliosis (Lyme's disease) and HIV/AIDS. Acute peri/myocarditis causes nonspecific ST segment changes. These can be accompanied by supraventricular and ventricular rhythm disturbances and T-wave abnormalities. The ECG shows low voltage QRS complexes in leads I, II, and III and a right axis deviation. This is caused by the increased pressure on the right chamber. This leads to right ventricular hypertrophy. The ECG pattern suggests an acute MI. All classical signs of MI may occur:; Q waves, ST segment elevations (>1mm, >4 weeks present)and T wave inversions are present. To exclude an acute MI, comparison with old ECG's is compulsory (MI has occurred years before). 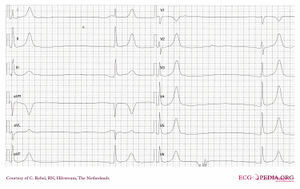 Often, a LBBB or broadened QRS-complex can be seen. Additionally, nonspecific ST segment changes are present with signs of left atrial enlargement. A HOCM is a hereditary illness. 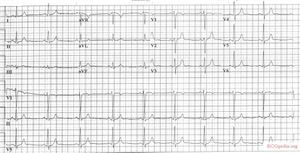 On the ECG there are signs of left ventricular hypertrophy and left atrial enlargement. Osborn wave. 81-year-old black male with BP 80/62 and temperature 89.5 degrees F (31.94 C). 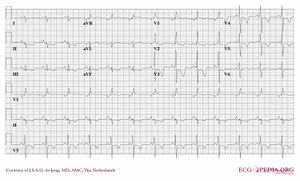 An ECG of a patient with a body temperature of 28 degrees Celsius. ECG of a 74 year old patient with a subarachnoid hemorrhage. Note the negative T-waves and the prolonged QT interval. In 1938, Aschenbrenner  noted that repolarization abnormalities may occur after increased intracranial pressure. 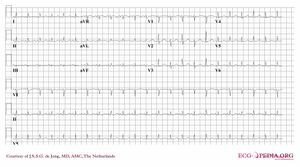 Since then, many publications have described ECG changes after acute neurological events. T wave changes. Large negative T waves over the precordial leads are observed frequently. These abnormalities are frequently seen after subarachnoid_hemorrhage (SAH) (if measured serially, almost every SAH patients has at least one abnormal ECG. ), but also in subdural hematoma, ischemic CVA's, brain Tumors, Guillain BarrÃ©, epilepsy and migraine. The ECG changes are generally reversible and have limited prognostic value. However, the ECG changes can be accompanied with myocardial damage and echocardiographic changes. The cause of the ECG changes is not yet clear. The most common hypothesis is that of a neurotramitter "catecholamine storm" caused by sympathetic stimulation. 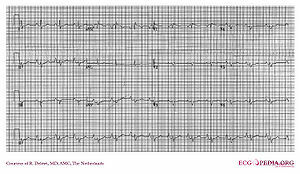 ECG from a patient with Ebstein's anomaly showing huge P waves and low amplitude QRS waves. 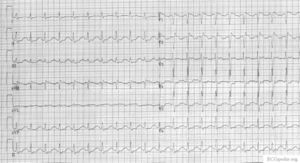 RBBB and T wave inversion are not present on this ECG. In Ebstein anomaly the tricuspid valve is inserted more apically than normal. This yields a very large right atrium. About 50% of individuals with Ebstein's anomaly have evidence of Wolff-Parkinson-White syndrome, secondary to the atrialized right ventricular tissue. T wave inversion in V1-V4 and Q waves in V1-V4 and II, III and aVF. In patients with proven pulmonary sarcoidosis ECG changes can be used as a marker of cardiac involvement. 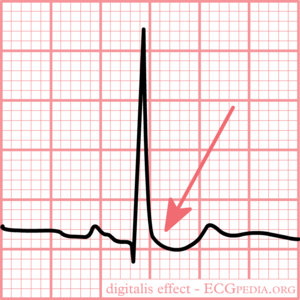 Presence of a fractionated QRS or a Bundle Branch Block increases the likelihood of cardiac involvement. This page was last edited on 31 May 2012, at 02:26.